Ted DeWitt-Clinton is a student at Lawndale High, likely named after historical figure DeWitt Clinton. 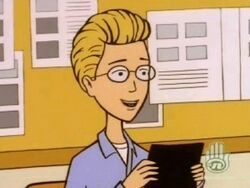 In the episode, "The New Kid," Ted plays a major role as Daria's potential love interest and (arguably) her first date. Despite this, the character would almost never reappear in the series again, conspicuously absent from all subsequent class scenes and all season five episodes. Therefore, it is not entirely clear whether he and Daria were in the same grade. Ted's last name is a reference to New York Governor DeWitt Clinton. 207 - The New Kid - He makes his debut appearance in this episode, where he is one of the main characters. 406 - I Loathe a Parade - He photographs Daria and Tom, for the school yearbook, and has a single line of dialogue, revelatory for the central conflict of that episode: "Thanks, Daria. It's for the yearbook. I'm getting some really great pictures of couples tonight." Also, in episode 403, he has a brief background appearance. Ted's parents are Leslie DeWitt and Grant Clinton. It is unknown if he has any siblings. They live in a two-story house in Lawndale. Ted's parents vocally claim a dislike for modern society and its "offerings." Their house is equipped with solar panels. They plant corn, squash and beans in the front and back yards. They don't drink coffee or alcohol and do not watch television. They hate the Beatles and gum and despise Greenpeace. Ted and his father have made a wooden couch, carved from a whole tree, and built a phonograph from scratch. By his own admission, Ted had a very sheltered childhood, including being home-schooled, prior to asking his parents to change to a public school. Because of this, he is portrayed as being naïve and unaware of the realities of school and normal teenage life in Lawndale. Despite this he has a number of cultural interests: he is interested in Viola de Gamba (The New Kid) as well as photography, having worked for the school yearbook ("The New Kid," "I Loathe a Parade"). He also knows how to make jewelry, has taught himself to fight with swords (by reading Medieval manuscripts on swordplay), and has practiced isometric exercises, which he can use in self defense ("The New Kid"). In The New Kid he courts Daria after a fashion, giving her a piece of jewelry that he made himself among other things. He displays a quiet courage, resisting social pressure for his suggestion to alter the yearbook to cut clubs in favor of volunteer work and charity fund-raising. He displays an equally quiet, casual cruelty in twice-rejecting Daria. Daria - Um, Ted, I think I owe you an apology. Your necklace was beautiful and I was a jerk for not taking it. Daria - Really? Good. Then I was hoping you'd let me buy you a slice of pizza. Ted - To be honest, Daria, I think maybe you were right. We should keep our friendship on a strictly yearbook level. Daria - Wait a minute. Are you blowing me off? Ted - Well, my parents warned me that kids in conventional school can be kind of... shallow. Daria - You think I'm shallow? Ted - You sort of remind me of that really popular girl I've seen around... Quinn, I think. Do you know her? You'd probably get along. And, the second time, Ted ignores Daria in order to play with swords with other boys. In 2001/2, Ted was the host for the Definitive Daria page "That's Dariatainment". Ted admits to becoming a big fan of modern TV, including professional wrestling and "the haunting allure of Charlie Rose. Those sad eyes of his have seen so much. What's happening to me?" Ted is usually displayed as a naïve and sweet young man in fanfiction. Because of these characteristics, he has been popularity paired with Stacy Rowe as her love interest, since they seemingly share the same sweet disposition. Another popular fandom assumption is that Ted is gay (and this is without most fandom knowing about his "haunting allure" issues! ), and he's been paired with Robert quite often. This trope has been subverted in The Excellent S's Lawndale Fighting Championship series where, teamed up as "Da Nice Guyz", they act comically friendly to each other. It is up to colour commentator Janet Barch to imply that there is more to their relationship. Ted is scheduled to appear in the Legion of Lawndale Heroes series as of Chapter Fourteen. This page was last edited on 11 August 2017, at 22:05.